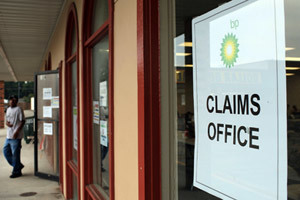 NEW ORLEANS – A fisherman who was represented by a law firm alleged to have aided in a previous false BP claim on behalf of another fisherman has been accused of filing a fraudulent $50,000 BP claim that he may not have to pay back because he received a payment through a lawsuit financier. Special investigator Louis Freeh filed a motion to request that claims made on behalf of Jarrod A. Burrle to the Deepwater Horizon Economic Claims Center (DHECC) be repaid. In the motion, Freeh says that Burrle claimed he took in more than eight tons of seafood a month alone in a 16-foot aluminum boat and asserted that his personal seafood consumption was several hundred times the average rate at five pounds per day of blue crab, nearly 3 pounds of shrimp and two pounds of oysters for each of the seven adults he claimed to have provided for each day. In addition, Burrle is alleged to have filed fraudulent tax documents created to support the revenue he claimed to have lost due to the oil spill. The request comes after U.S. District Judge Carl Barbier, who is overseeing all claims litigation in the U.S. District Court for the Eastern District of Louisiana related to the the 2010 Deepwater Horizon oil spill, asked that Freeh investigate suspicious claims. In Burrle’s case, a 2010 federal income tax return he provided to the Gulf Coast Claims Facility (GCCF) showed he had made $53,385 as a commercial fisherman. However, that tax return was allegedly never filed with the Internal Revenue Service and was created solely to deceive the GCCF, according to Freeh. Based on Burrle's claims, DHECC paid him a total of $50,015.87 and had already offered him another $26,493.84 for a captain claim that had not yet been paid. In addition, Burrle was paid $46,400 for chartering his vessel during the oil spill cleanup phase as part of the Vessel of Opportunity program. As part of his investigation, Freeh interviewed the mother of Burrle’s child who said he owed her back payments for child support dating back to 1996 and that he had been incarcerated for non-payment for part of 2009 and that he had not been working. In addition, she said she never knew Burrle to catch of sell seafood and that he never gave her fish or crabs, according to Freeh. Although Burrle was granted the claim it went directly to lawsuit financier company Woodbridge which had already made a contingency payment to Burrle and who, according to Freeh, is liable for the claim as they had an agreement with Burrle that he would not be responsible for repaying the financing if he did not receive a claim. “The argument that Woodbridge had no knowledge of Burrle’s fraud is of no relevance, as restitution is appropriate even when the party retaining the benefit from an improper claim is not a wrongdoer himself,” Freeh’s motion reads. Under the claims, Burrle’s former law firm, AndryLerner, received a payment of $12,503.96 for representing him. AndryLerner was also at the center of a disputed $357,000 claim by shrimper Casey Thonn, who was also found to have used false tax documents that were never filed with the Internal Revenue Service as the basis for the claim.